Located in the city center of Madrid (Puerta del Sol). 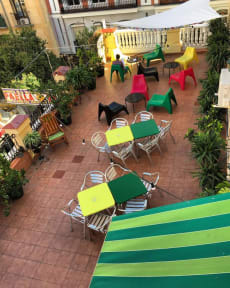 Barbieri Sol Hostel has 12 rooms divided into double or dormitory rooms of 4 or 6 beds. All of them equipped with bunk beds, air conditioning and heating, free private lockers where you can use your own padlock, free bed linen, 24 hrs hot water. 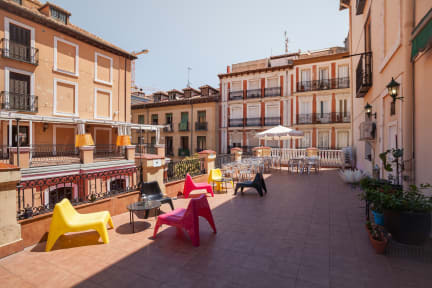 From our Hostel you can just walk to Plaza Mayor, Prado, Reina Sofia Museum, The Retiro Park, the amazing neighbourhoods of La Latina (with El Rastro on Sundays), Lavapies or Malasaña. You can use our free Wi-Fi access, in all areas of the hostel. Guest will enjoy our Lounge area, kitchen with a microwave, a fridge, TV Set, Free printer for yours boarding pass and do not forget to visit our open-air terrace, where you can have some drinks and make some new friends from all over the world . We are looking forwards to meet you in our 24 hours reception where we are going to give you any travel tips about our fantastic city. Please, advise us about your arrival time.